Hello! This weeks challenge is called "For the Love of Water" which means, let's do some water coloring!! Yep any water coloring project is the theme. I don't really know how to do water coloring, I know, I know, I really need to learn how!! Whew!! Hahaha! Hope you will give the challenge a try this week. Be brave like me and give it a try because you never know until you try stuff, and I'm really glad I did!! Pretty good? It's awesome! The brick wall looks especially cool and I love how the little doggie moves. 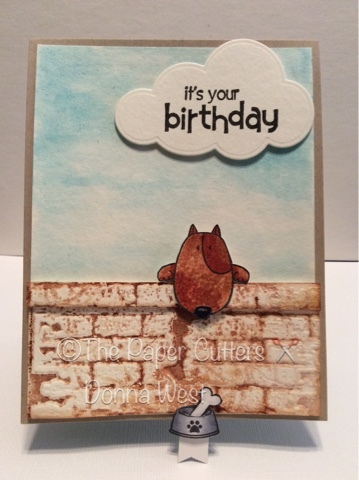 Such a cute card - and how fun that it's a slider! Your brick wall looks AMAZING!! I LOVE your idea and it worked out so wonderfully well! This card is AMAZING!!! You nailed the watercolouring and the slider to boot. Hugs!! Such a fun little scene. Smiling!